After three months of active filming, Tiny Times <小时代> finally wrapped up their cameras and began post-production. The directorial debut of Guo Jingming (郭敬明), Tiny Times is a motion picture adaptation from Guo’s own bestselling novel trilogy of the same name. The film stars famous young idols from both mainland China and Taiwan, including Yang Mi (杨幂), Amber Kuo (郭采潔), Bea Hayden (郭碧婷), Hsieh Yi Lin (謝依霖), Kai Ko (柯震東), Jiang Chao (姜潮), Chen Xuedong (陈学冬), Rhydian Vaughan (鳳小岳), and Calvin Du (杜天皓). New pictures from the Tiny Times set have recently surfaced online. 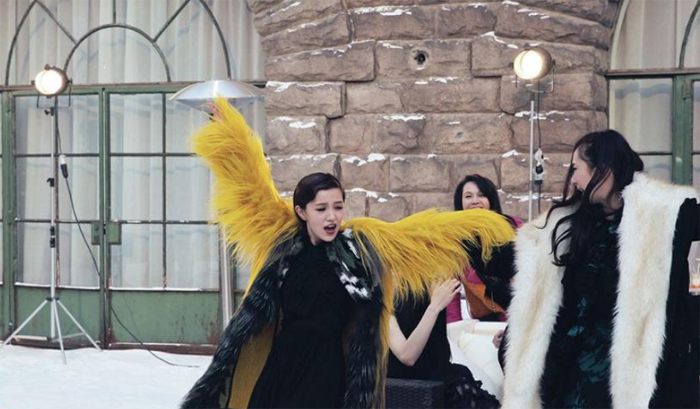 The first set of photos feature the main cast shooting in the snow. The second set features the cast playing around behind the scenes. As seen in the photos, all the young stars got along really well with each other on set. But Guo expressed that the cast liked each other a little too much. There was never a moment of tension between the actors, and pranks became a very common thing to deal with between the actors. “No one seemed to be serious about their work,” Guo laughed. Tiny Times is currently scheduled for a theatrical release in mainland China on June 27, 2013. The film’s first trailer will be released on April 22.